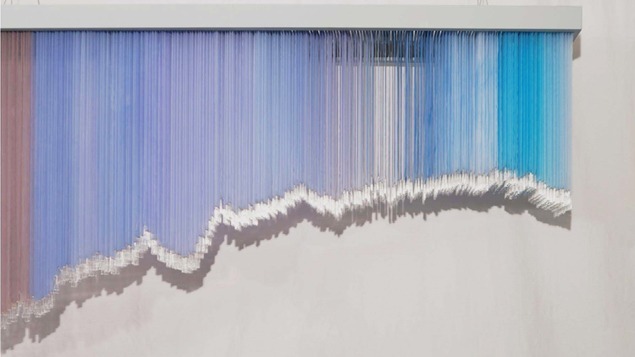 Anna McKee’s Reliquary is a sculptural installation comprised of 3,405 glass ampules that she sewed to 678 silk panels in a long hanging row creating a subtly swaying wave form. The entire piece suggests a graph. Shifting hues hint at untold levels of information and a deep measure of time. Though abstract, the installation’s form is the expression of 68,000 years of temperature history from an ice sheet. McKee collaborated with Seattle composer/sound artist Steve Peters, who created a multi-channel sound piece, taken from recordings of the reliquary ampules. Steve makes music and sound for many contexts and occasions using environmental recordings, found/natural objects, electronics, acoustic instruments, and voices. His work is often site-based, attentive to the subtle nuances of perception and place. McKee’s art practice is informed by an interest in history and environmental sciences. She seeks evidence of time and meaning in the land, especially at the intersections of human activity. Glacial ice became a metaphor for the deep memory of the natural world. Living in the Puget Sound Basin, a glacially sculpted environment has been a potent influence. In 2009, McKee visited the WAIS Divide Ice Core field camp in Antarctica through the National Science Foundations Artist and Writers program. She interviewed scientists, watched ice being drilled from a two-mile deep ice sheet and spent hours drawing the white open space. Time on the West Antarctic Ice Sheet was a powerful influence on her work, and for several years she gestated ideas for a larger installation. In 2012, Eric Steig, Professor of Glaciology at the University of Washington, invited her to fabricate the glass ampules for the WAIS Reliquary at his research lab, using surplus water samples from over three kilometers of glacier ice. He and several graduate students also shared data and insights that contributed to the design of the reliquary.